Chronic disease is winning in urban Ecuador. The neighborhood surrounding El Centro Medico would be considered a "food desert" in the US. Much like the urban populations of the United States, my patients in Ecuador lacked the access to healthy food choices. Instead of the vegetable-focused, low-carb diets that ward off heart disease and diabetes, my patients were limited to rice, beans, pasta, oil, and of course, Nestle prepackaged sweets. The taste of water was as unappealing to the individuals in Santo Domingo as it is to my patients in the States, but the taste wasn't even its ultimate deterrence; rather consuming it put you at risk for giardia and other waterborne pathogens. The choice of buying water versus a more satisfying sugar-filled beverage left people with empty calories, obesity, and poor dentition. Many of the challenges my patients faced can be summed up by poverty and are not unlike some of the struggles poor people all over the world face. The difference for my community in Ecuador is that, in addition to the global issues of limited access to healthy food options and unsafe water, they also face social stressors that are otherwise more supported in the neighborhoods where I work in the US. Working with vulnerable populations here and abroad is what drew me to medicine, and I am not unfamiliar with disparity. However, in the US -at least in the Community Health Center setting- I am able to offer medication assistance, behavioral health, and other social services. As the only female provider at El Centro Medico I had multiple female patients -wives and daughters- that would present with a routine complaint, but once the door to my office was shut, would hesitantly divulge stories of sexual, physical, and emotional abuse that left me feeling atrociously helpless. In the US, it is not uncommon for vulnerable populations to suffer abuse like intimate-partner violence but here I can at least offer social work support and for minors I can report the perpetrators to the appropriate authorities. 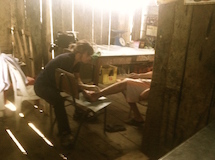 In Ecuador all I could do was screen for STIs and reassure the women that it was not okay, it was not their fault, and encourage them to return to the clinic for any additional support. So in the end, the fact that chronic diseases are winning was a disappointing but not surprising frustration about my patients' situations in Ecuador. What was more heartbreaking was the number of female patients who lacked the support, the power, and the representation to feel safe in their own homes, to have their needs met, and to live without fear from their husbands and fathers. I met healthy partnerships too, but the volume of abused women seemed disproportionate and is a part of my experience in Ecuador that will always stay with me. My next step is figuring out how I can return and advocate for those women.